This review is part of our Coen Brothers series. All three of the films I reviewed for the Coen Bros series received a five star rating (this, “A Serious Man”, and" “The Big Lebowski”). I love the Coens. I think the way that they wrestle with big issues while telling vastly different stories with a wide range of tones is amazing. 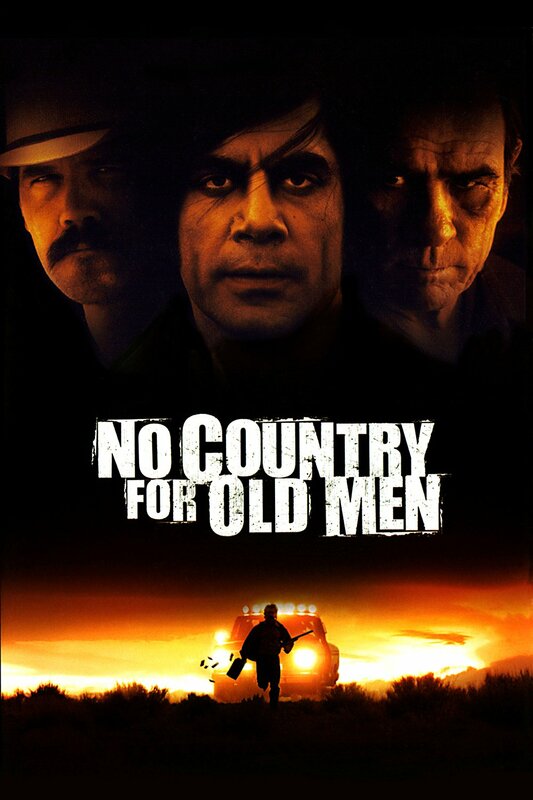 “No Country for Old Men” is the film that won the brothers Oscars for Best Directors, Best Adapted Screenplay (Cormac McCarthy wrote the novel), and Best Motion Picture, and Javier Bardem won an Oscar for Best Supporting Actor for what might be one of the most terrifying portrayals of a psychopath brought to screen. “No Country” is undoubtedly the brothers’ most violent film and probably their grimmest as well. There is little of the trademark gallows humor that usually is so pervasive in some of their other movies; this film makes you take a look at the nastier side of life. It wants you to realize that while there might be great beauty and joy in life, there is also its opposite: horrible pain and evil. After discovering two million dollars at a drug deal gone south, Llewelyn Moss (Josh Brolin, “Sicario”) takes the money and returns home, unwittingly setting off a chain of violent events that will change his and his wife Carla Jean’s (Kelly Macdonald, “Trainspotting”) lives forever. Meanwhile, Elderly Sheriff Bell (Tommy Lee Jones, “The Fugitive”) tries to understand the horrid violence left in the wake of Anton Chigurh (Javier Bardem, “Biutiful”), the murderous psychopath hit man in pursuit of Moss. I’d rather not go too much into this story’s details because the premise of “No Country” is rather simple (you could boil the plot down to the first line of the Dark Tower series: The man in black fled across the desert and the gunslinger followed). It’s essentially a cat and mouse game; but the way that it’s executed is beyond brilliant. Pulitzer prize winning author Cormac McCarthy (The Road, Blood Meridian) is known for his violent, visceral stories with grim themes and outlooks, and the Coens perfectly capture the tone that his novels set. The amount of violence in this story might be shocking to those who know the Coens from their more comedic work (“The Big Lebowski”, “A Serious Man”); even as I sat down to watch this movie for what was probably the eighth or ninth time, I found myself cringing at some of the scenes, and the main reason for that was Javier Bardem. Javier Bardem is the reason this film works so well. I’ve seen articles talking about how Bardem gives one of the most (if not the most) accurate portrayals of a psychopath ever brought to screen. I can believe that. He is absolutely terrifying. There’s a scene not too far into this film where Anton Chigurh (Bardem) buys some cashews at a gas station. Chigurh begins messing with the elderly attendant. The gas station attendant, visibly shaken by the encounter, asks Chigurh “Is something wrong?” “With what?” Chigurh growls. Gas Station attendant: “With anything?” The way that Chigurh sneers at that moment is so chilling. “Is that what you’re asking me? Is there something wrong with anything?” Chigurh goes on to ask the attendant to flip a coin. What’s at stake, we realize though it is not explicitly stated, is everything. 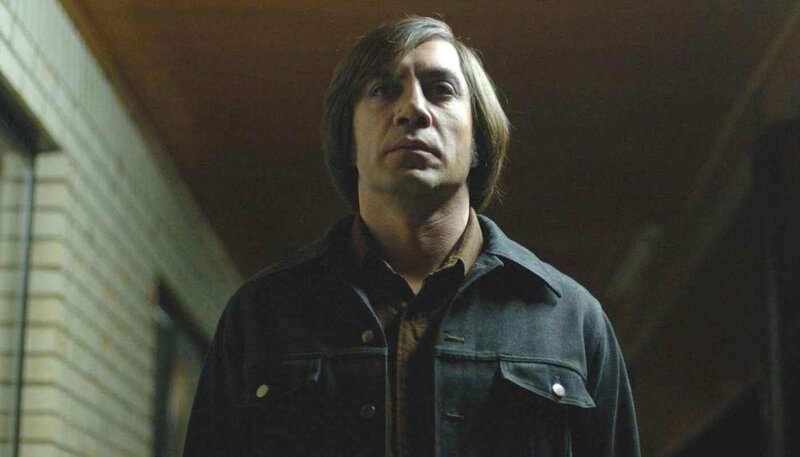 The Coens want us to look at Chigurh in this moment and realize that he is the personification of all the chaotic darkness in the world that we can’t even begin to grasp. Chigurh doesn’t care if the attendant flips heads or tails, he doesn’t care if the man lives or dies, to him, the attendant is just something that might get in his way. As the film goes on, and Chigurh’s kill count ramps up, he comes to represent death itself; no matter where we run, no matter what we do, eventually he will find us. While Bardem’s performance is really what drives this film, it’s Brolin who is primarily our main character. Watching him navigate the desolate desert in an attempt to outmaneuver drug cartels and Chigurh is incredibly tense. From the moment we first lay eyes on the drug deal gone south, we feel tension wrap its icy claws around the base of our spine, and that feeling never goes away. Brolin is fantastic as Moss; he’s smart in a street-sense sort of way, and he’s likeable and relatable enough that it’s easy to put yourself in his shoes (if you were to find two million dollars out in the middle of nowhere, you might do the same thing he did). Tommy Lee Jones is pretty great as Sheriff Bell; his whole character’s persona can be summed up with the opening voiceover, during which he relates to the viewer that Bell and his father were Sheriffs of different towns at the same time, and how some of the old Sheriffs never even had to wear their guns. This scene speaks to the changing of violence over time, how times have progressively gotten worse, how mankind is more prone to darkness. The closing monologue, which again wrestles with the difference in the ways he and his father saw the world, is incredibly powerful, yet bleaker than hell. While I find this film to be utterly astounding, and this is the only Coen film that won them the Oscar for Best Picture (and Directors- they previously won a Writing award for “Fargo”), I’m not even sure if this is my favorite Coen brother film. That right there should speak to the brilliance of these brothers. There are very few directors that I can point to and say, “They have so many masterpieces that it’s hard to pick a top five.” The Coen brothers have had a wonderful career, and I believe they’ve cemented their names along other cinema greats like Fellini, Kubrick, Tarkovsky, Bergman, and Tarantino. “No Country for Old Men” is a brutal, bleak, disturbing modern western, it screams its message loud for everyone to hear, and while at times it might be hard to watch, it is almost impossible to turn away.